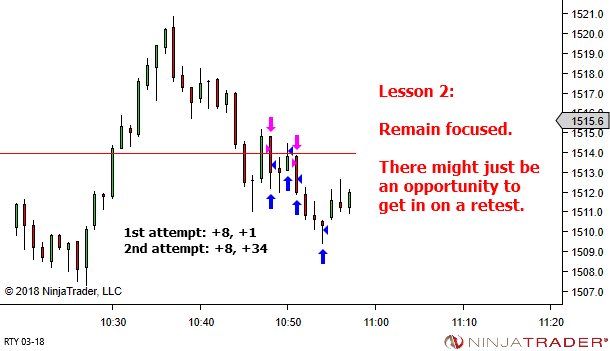 The aim of today's post is to highlight two lessons we discussed in previous years, which came into play in a recent price sequence. We don't profit from regret. We profit from quality decisions in the NOW. 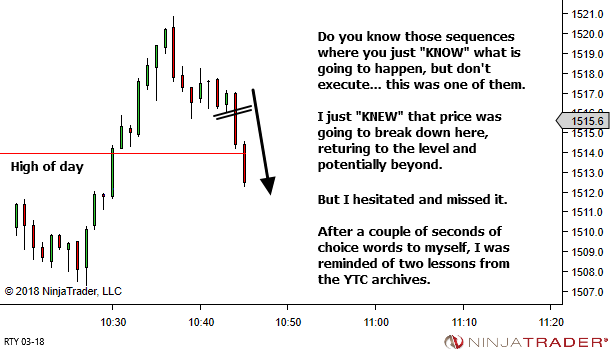 So when you miss a price sequence that you feel you "should have" caught, you need a way to move past it quickly to ensure that it doesn't negatively affect further decision making. 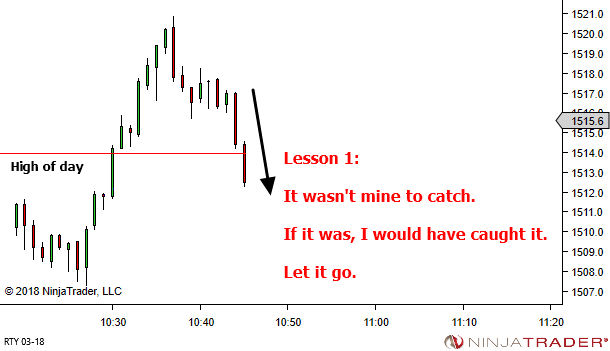 Lesson 1: It wasn't mine to catch. If it was, I would have caught it. Let it go. Lesson 2: Remain focused. There might just be an opportunity to get in on a retest. Great point Alan. Thanks. You’re absolutely right. Let it go. There is more opportunity coming and feeling sorry for ourselves right now serves no good purpose. Lance, in the first image where you have drawn black break line, the trend was still up. First dn swing from top was impulsive, so I would wait for second weaker leg dn (CPB). At black break line my bias would be long. What thought process led you to have short bias? Your decision is fine. Recognising the first down swing as impulsive, and seeing the second leg as a very high probability, I was simply hoping to trade it down to the breakout level. From there, if that level held, it would offer a CPB/BPB long, as you’re suggesting. So yes, the primary TTF bias was LONG. And the trend was up. This was just a counter-trend move for one leg. Of course, I missed the entry. And when the move broke resistance rather than holding, it offered an even better second chance entry on a subsequent retest of the level. Thanks, Lance for your insight.